Rejection is easy. Rejection is fun. Rejection gets you the best stories. It's acceptance only to have it blow up in your face that is scary. It's even scary when you realize you might built your life around the person before it all falls apart. I know I have been leaving a lot of comments lately, but you have been just so spot-on. Congrats on getting posted on NPR. Don't know if anyone has told you yet. 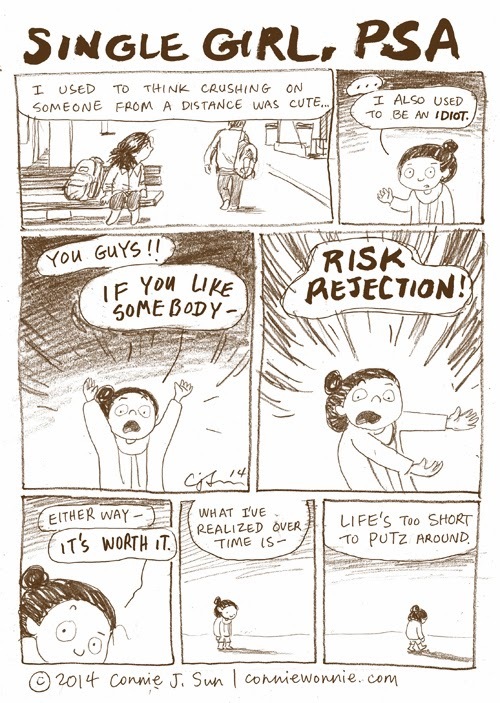 Rejection is so aweful and yes life is so short. I guess for so many rejection is something that has happened so often that it causes pause when you see someone that you want to ask out. As always you are speaking the truth and on this subject the truth does hurt. Once again, thanks for letting so many know that they are not alone in the horrors of dating. I need to find a way to send this back to, say, 16 or 17 year old me.